I love being a vintage clothing dealer and getting to handle all sorts of neat vintage treasures but it's also hard when you come across things that I absolutely love that you have to sell. It's either have lots of fabulous things and not pay bills or run my business and pay bills! 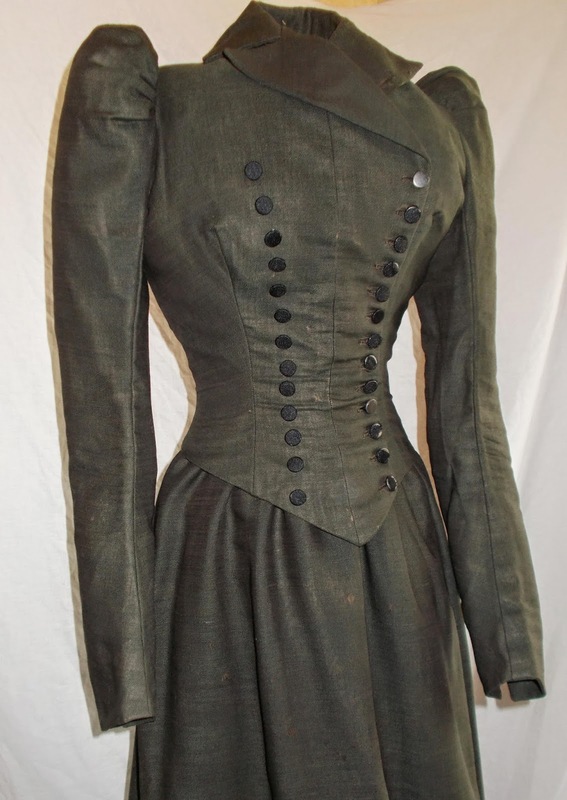 One such item is a late Victorian riding habit from c. 1889- 1891 that I as very lucky to recently acquire for my vintage clothing website, Corsets and Crinolines. 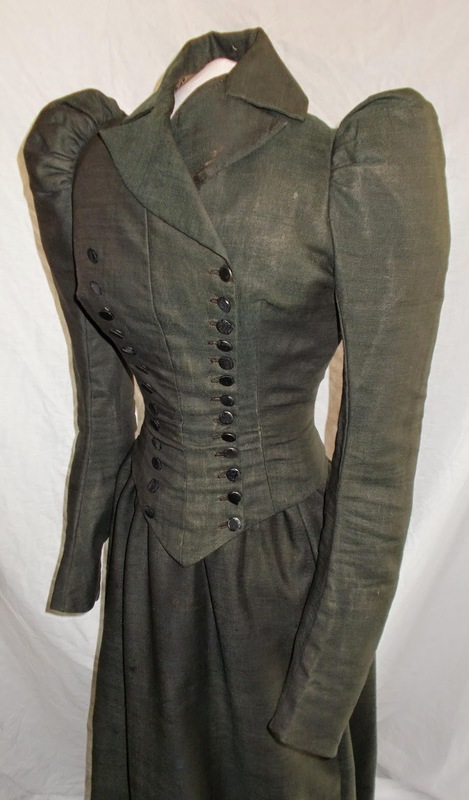 It's made from khaki green nun's cloth (an itchy loosely woven wool) with "kick-up sleeves" and a double breasted styled front, both of which, were popular during this time. 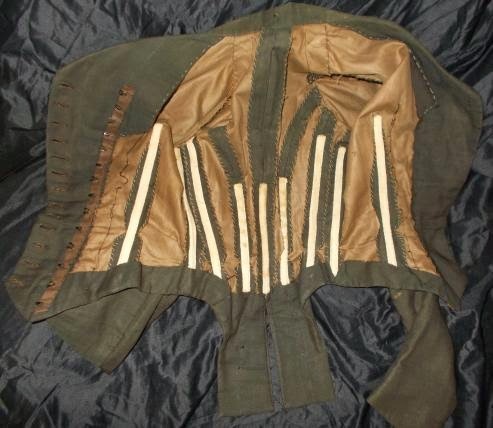 The inside of the bodice is lined in brown cotton and heavily boned with spring steel boning. 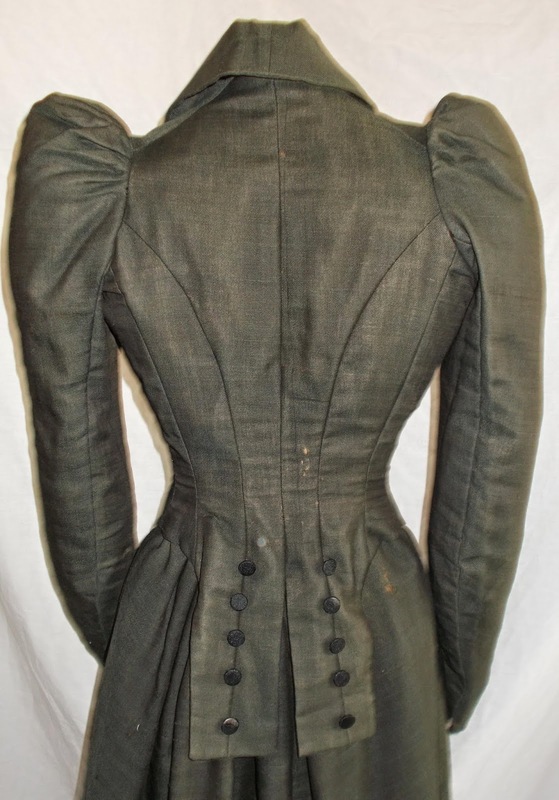 The back of the bodice has the typical squared off peplum which were typical of riding habit bodices from the late 1860's right to when riding habit jackets became the norm. The skirt is not a safety apron and is rather full with pleats all around the waist/hips to allow for the extra fullness for riding and is very long at 50". It is an older style of full riding skirt based on 1860's styles without any safety slit or opening to accommodate the pommels. 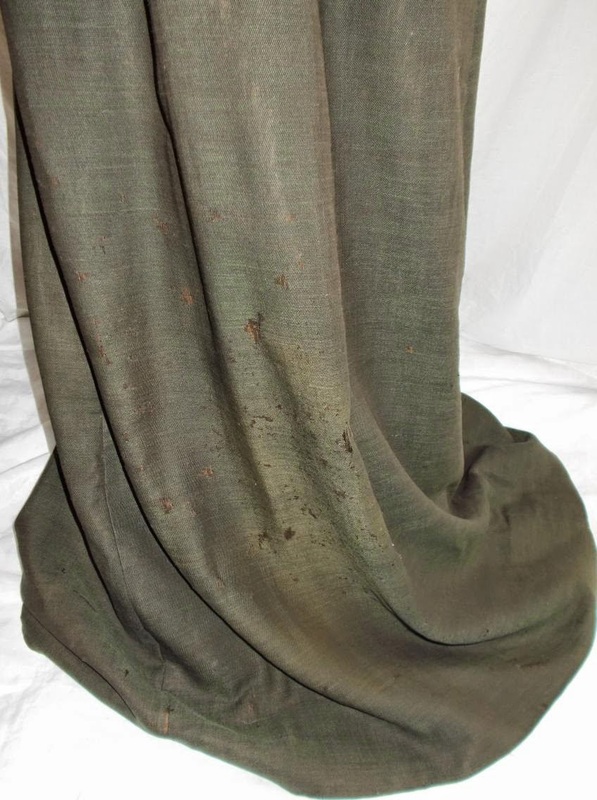 The middle to bottom portion of the riding skirt has wear and fading form where it was pressed against the safe of the saddle by the right left and rubbed against it. 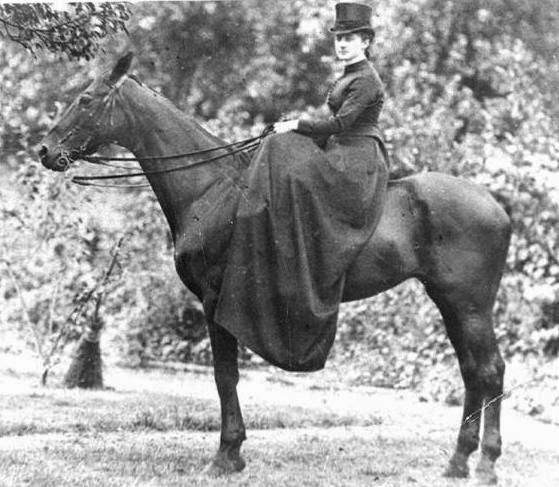 Here is a photo from c. 1885 of Florence Lewis in her riding habit probably taken in East Sussex at Upper Dicker. Although her bodice is styled slightly different to the bodice on my habit (same squared off peplum though! ), the skirt is near identical in pattern, length and fullness to the riding skirt on my antique habit. 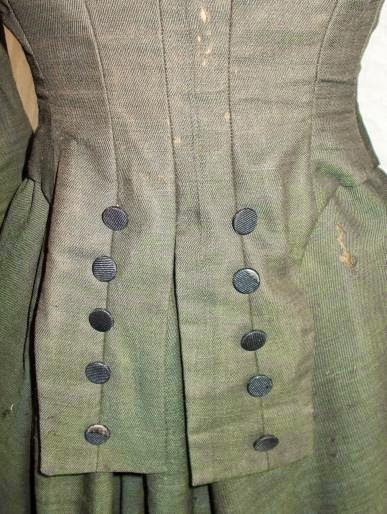 The photo is an excellent example showing how the skirt would have looked and hung once mounted. The habit was made for someone 5ft to 5'2" and is very petite in proportion as it has a 32" bust (so the wearer would have had a bust measuring about 30") and a 21" waist (so the wearer would have had an 19"- 20" waist to allow for ease of movement. 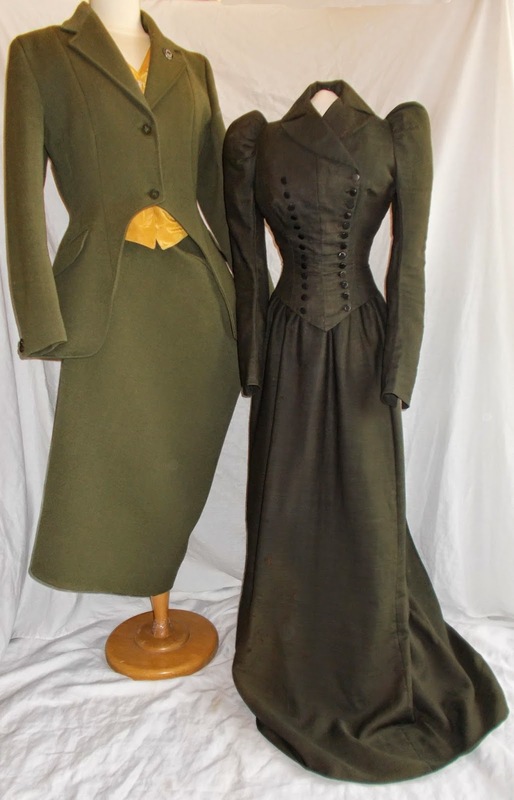 For fun, I put it beside my own riding habit made about 125 years later in 2013 and on a dress form set to my height of 5'9" and my dress size of a UK 16 (so a 42" bust and a 32"- 34" waist). Although my riding habit isn't really representative of modern sizing as I'm still taller than most people (men and women) today and a larger dress size than what most women wear, I just thought it was a neat comparison between old and new and two habits at opposite ends of the size charts! Although I love the styling of the antique habit, it makes me appreciate my modern habit even more for it's safety apron and the fact I don't need to wear a corset with it!